Zuko's Wardrobe. Kay I was searching deviantart... and found this. I found it entertaining because today I made that crazy zuko-outfits question. So... uh here's all of them. Good on you, artist!. 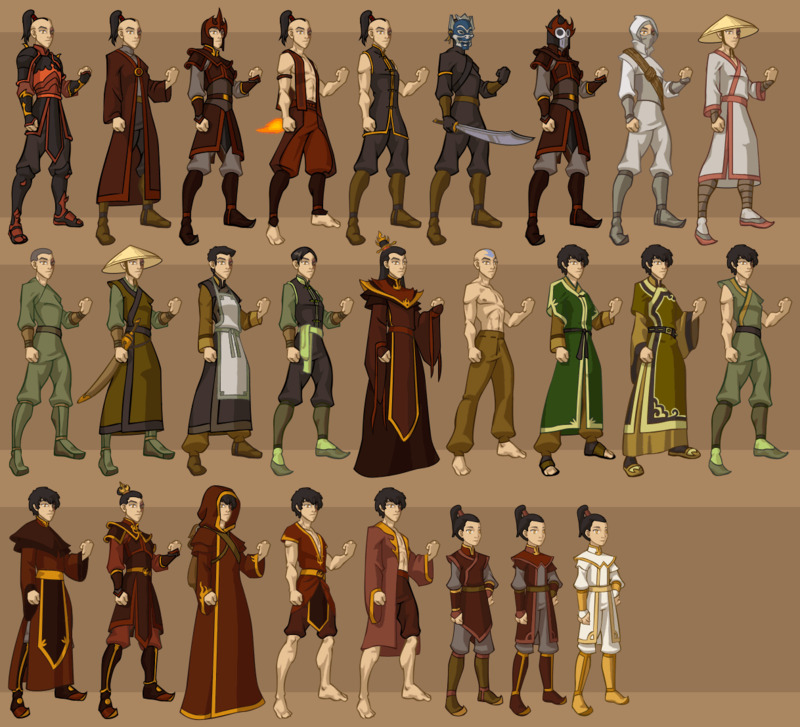 HD Wallpaper and background images in the Avatar The Last Airbender club tagged: alisachristopher avatar the last airbender zuko wardrobe image fan art outfits. aww... and darn. I knew I missed a few. Hee! How many outfits does he have? WOW!! where does he get so many from!! some of the outfits were from scenes that were cut. I know the first outfit was from the unaired pilot. OH MAN!!! I totally love him in his armor! OH! i think you forgot the ninja outfit he wore in "the southern raiders." that episode wuz so weird.. no!!! IT"S JUST UR OPINION AND MAN THIS PERSON CAN SURE DRAW!!!!! And he DID wear the first one, he wore it in book one!!!! hes a cartoon.... how is he hot??? where does he keeps all these???????????? that first one is really cool but ya I don't think he wore it. oh ya he wore it in the unaired pilot nevermind! Their separated into like three groups. Warrior outfits: Earth Kingdom style: and Prince outfits. Hey! Where are his outfits from The Boiling Rock? SO MANY COMMENTS!! and yeah some are from unaired episodes! I am trying to put together another movie based entirely of the TV show in its entirety the movie may be 5-8 hours long but at least people will be able to see it with every single chapter, story and plot. All I need is actors that already had the costumes and I have camera lights, studio equipment and I am good with 3d special effects. I will follow the TV show frame by frame and create a something far greater than what anyone may think possible. Due to the fact that I am a fan of avatar and I will only do nothing but the best. If anyone out there is interested, I am located in Dallas TX and I am looking for anyone close by who can help, but I don’t have money to produce it. Most of my money has already gone towards equipment. That is so cool! I never knew zuko had so many outfits! 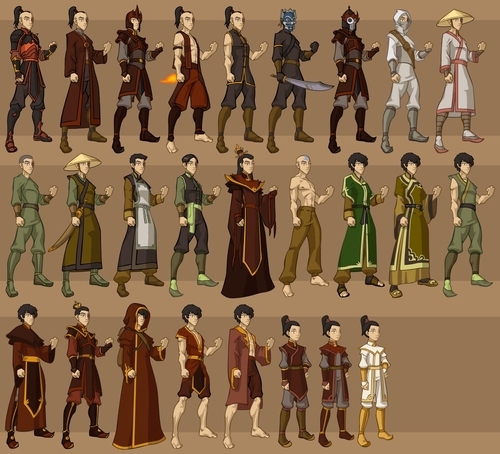 26 outfits wow oh and he had a nightmare of wearing the aang outfit when he was sick.